Ever since the so-called halcyon days of Ronald “walks-on-Conservative-waters” Reagan, our country has gone down a path of total contradiction to all things good and American. At one point in time, our country cared for and about all people. It was not accepted for us as a nation to angrily castigate the poor, the immigrants, the uneducated, or any other group that needed some form of public assistance; either some, or all, of the time. But when Reagan took office, he brought his changed view of what government should and should not be for the less fortunate — remember, he was the president of the Actors Guild, a union for god’s sake, how left wing can you get? — and the mantra became ‘We should not have to spend public dollars on wastrels who need help with food, health care, or education… let them stand on their own!’ The differentiation between those who could but didn’t (lazy people) got mixed up and confused with those who could not (unfortunate people). Slowly, over the course of his eight years in office, it became acceptable to castigate government for every ill in society. Today, with the help of FOX news and the Koch brothers, that theme is not only accepted, it is even applauded. 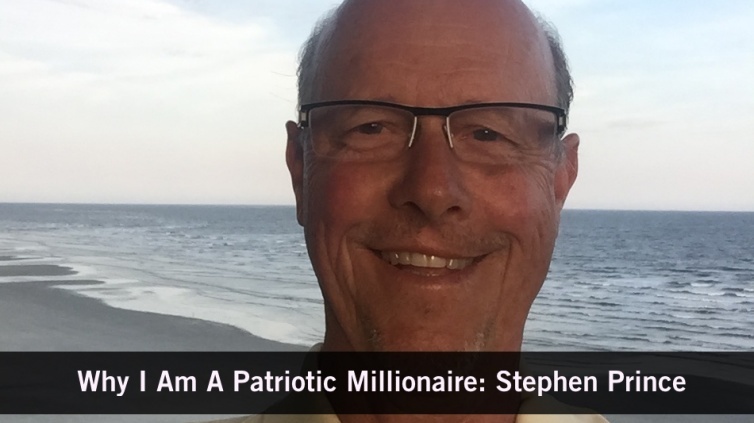 As I watched this nationwide transformation unfold, I became fixated on figuring out a way with my limited resources, albeit significant enough to qualify as a Patriotic Millionaire, to right the ship of fairness. I am no different from any other people who have fallen in love with the “I hate big government” song. I don’t want to pay taxes. But the reason why I don’t want to pay taxes has little to do with what I think of government. The reason I don’t want to is the same as everyone else’s: I am greedy. I want to keep every dollar that I make. But I part with the “other side” in two important ways. One, I admit that I am greedy. Two, I realize that government of all types— federal, state, and local — serves society in ways that myself and other fortunate people won’t. The rich don’t feed and house the less fortunate; educate the masses (people who can’t afford the private schools that we send our kids to); they don’t build roads and other infrastructure that society needs to grow and prosper; or fight wars, many of which, if not most, we shouldn’t fight. Government does and always has performed these tasks. It’s silly to think the rich ever will. Over time, I came to realize that my fellow greedy Americans — fortunate folks just like me — needed help in realizing the error of their ways. I knew I didn’t have the skill set, or quite frankly, the time to fight this fight. 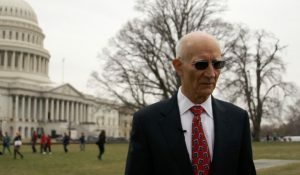 But I knew there had to be someone out there who did, who could and would wage the battle of constructing and disseminating a new, or actually old, approach to running and governing our country. A few years back, I had plans to commit one million dollars of my own money, find 99 other millionaires who shared my view and would also commit, and then get a journalist to craft and tell the story. I wanted to raise $100 million dollars toward the task of redefining and reclaiming our good governance. You’d think that was an impressive sum. I sure thought it was…. but just look at how much money the Koch brothers are committing in ONE ELECTION CYCLE!! EIGHT HUNDRED AND EIGHTY NINE MILLION, in 2016! Makes my $100 million goal look like chump change. 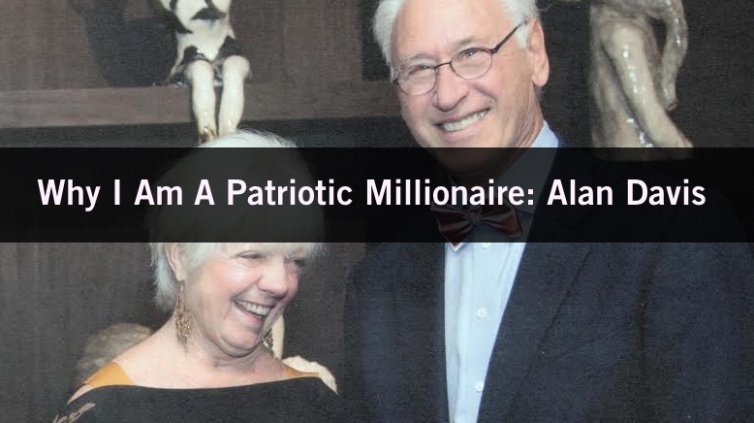 That’s why I am so thankful that I have I discovered the Patriotic Millionaires — or, more precisely, Erica Payne. After many conversations and much due diligence, I became convinced that she and her team present the perfect vehicle for telling the righteous story, and I determined no one else could make a dollar go farther. They understood and leveraged the power of social media in an amazingly effective way, enabling the organization to draw in hundreds of thousands of views for thousands of dollars, as opposed to hundreds of thousands, or even millions. So I joined. And I am glad I did. We haven’t scratched the surface of what we need or want to do, but we are moving in the right direction, and getting closer and closer, better and better with each passing month. So if you think you would qualify to join our ranks, come check us out. Drop me an email and we can talk. I love what we are doing and am totally committed to continuing the quest. I am embarrassed at what my generation has done and of the legacy we are leaving our children and grandchildren. Class hatred, bigotry, an immigration quagmire, a horrible widening of the gap between those who have and those who have not, and a $20 trillion dollar debt that has been created almost completely since the revered Ronald Reagan took office. We have to fix this mess we created. And even if we can’t really fix it, we have to at least try, don’t you think?